Science Research Class at Walden School on our second collection trip. After our fall semester, my research science class ended and the two sections of chemistry were consolidated down to one, with me teaching a computer technology course third period instead of chemistry. Without the two classes that could support the Tintic soil analysis project, I had to put the project on hold until I could get some more students involved. We also had an unusually cold January and February, with snow staying on the ground. This hampered our ability to collect samples. Between 3rd and 4th terms we hold a two-week Intersession at Walden School of Liberal Arts that allows us to teach specialty courses, and I dedicated my course entirely to finishing the Tintic project. Altogether five students took the course, including Jeffery, Indi, Sean, Jem, and Aaron. 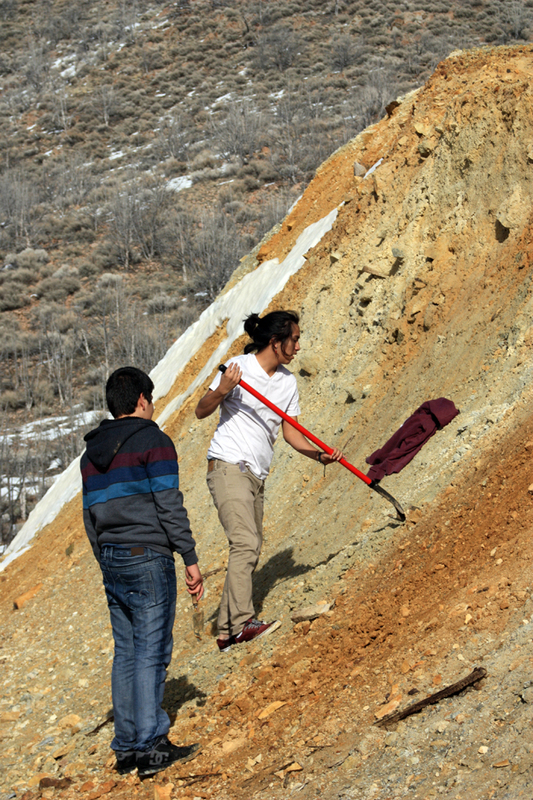 To finish collecting all the samples, we had to take three additional trips down to the Eureka area. We were fortunate that the weather cooperated and warmed up enough that the snow melted. 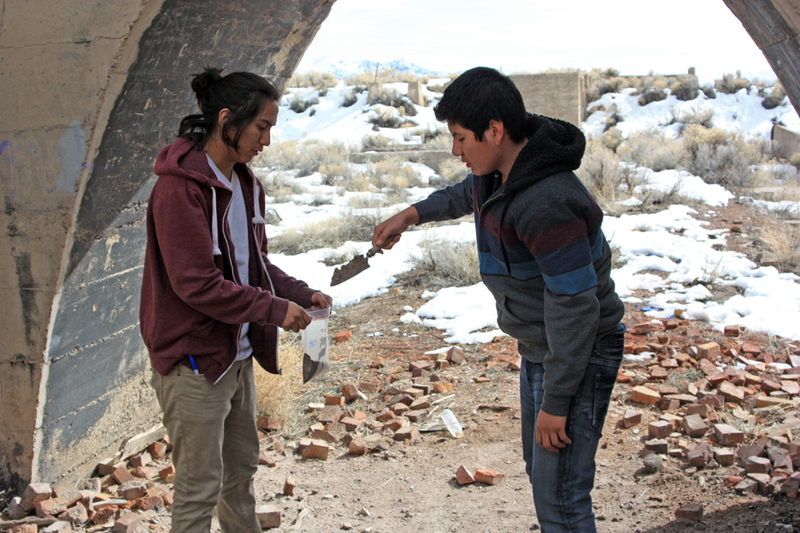 Our second collection trip was on March 5 to the area of the Knight Smelter, the cyanide leeching pile, and Silver City. 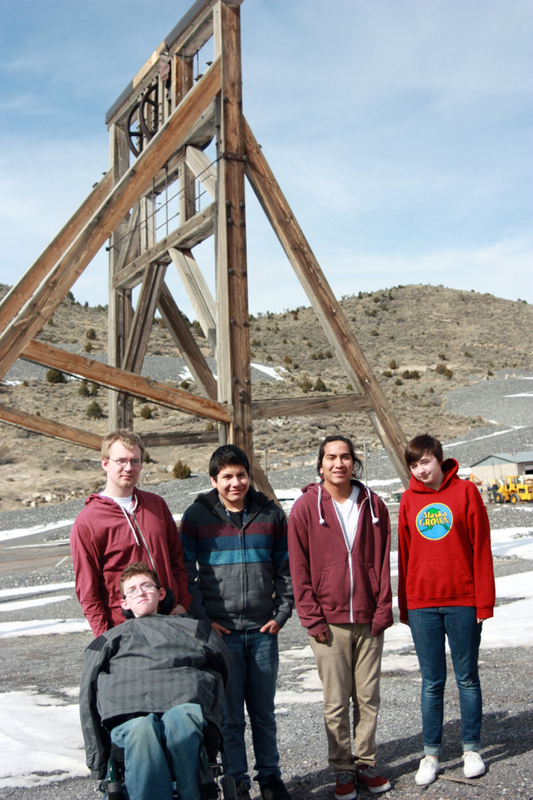 We stopped at the Bullion Beck Headframe on the way to take a group shot. 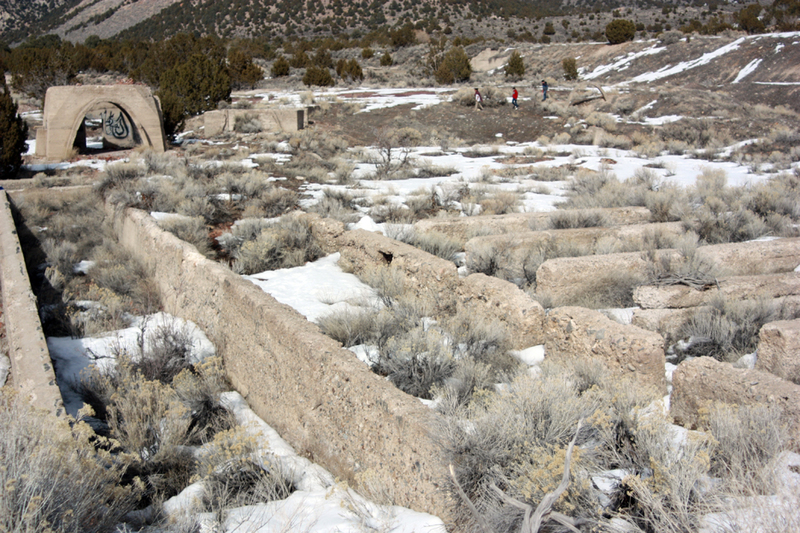 Ruins of the Knight Smelter built by Jessie Knight to process silver ore. The Knight Smelter was built by silver tycoon Jesse Knight, who made his initial fortune with the Humbug Mine, then expanded along the Iron Blossom lode. Eventually, Uncle Jesse needed a smelter to concentrate and refine the ores from his mines, and he built it south of Eureka near the Union Pacific line. To connect his mines with the smelter and the Union Pacific main line, he built a narrow gauge railroad so that the smaller engines could make the turns and the steeper grades. A fairly level grade was built around the hills into his mines, and the road I walked on to the Iron Blossom #2 last fall followed this old grade. Jesse Knight contributed quite a bit of money to what was then the fledgling Brigham Young Academy, now Brigham Young University. The Jesse Knight Building, where I had several classes, is named after him. The technology for refining ore went through rapid change in the 1920s. The smelter only operated for about four years, at which point it became cheaper to ship the ore by rail to the more modern smelters in Murray. The same thing happened with the Tintic Standard Mine and the reduction mill near Goshen. There isn’t much left of the Knight Smelter except crumbling foundations for the solution tanks, a few archways where the kilns stood, and a pile of slag. Just to the south is the leeching pile. During the 1980s the price of gold jumped up when we went off the gold standard and the price was allowed to rise. Investing gurus such as Warren Buffet were advising people to invest in gold, and that drove up the price even more. Now, all these old tailings and waste rock piles that hadn’t been economical to process suddenly were. A layer of thick plastic was laid down and the waste rock crushed and piled onto the plastic, then a solution of cyanide was pumped over the pile. The cyanide would chelate with the gold and silver and trickle down through the pile into its lowest area, where it was pumped out and transported for smelting. This same process is being used at the Cripple Creek and Victor gold mine in Colorado. 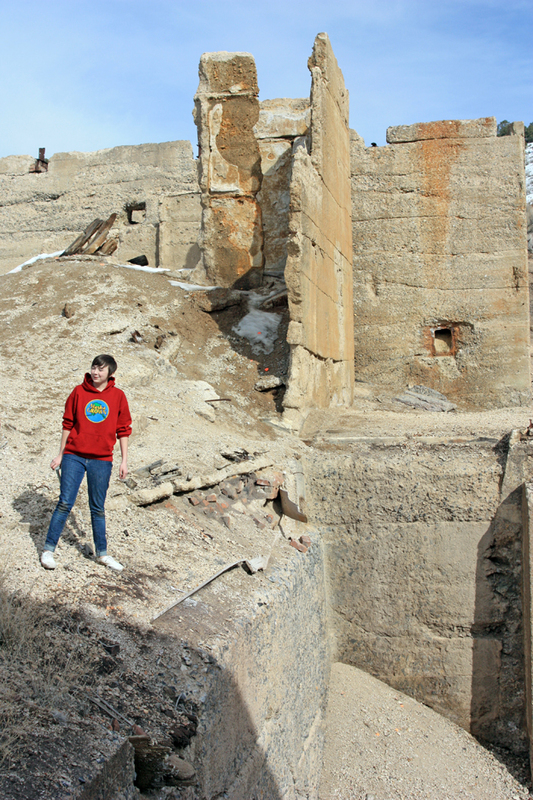 We walked into the old smelter ruins and identified spots where there would likely be contamination, such as inside the kiln and underneath the tanks. We saw that a layer of sand was laid down under the tanks over the original soil, which is now covered with new soil deposited since the 1920s. We also collected samples from the top of the leeching pile. I picked up some samples of slag as well. This smelter took the original ore and concentrated it by crushing and chemical action, using both physical and chemical separations. Mercury was used to bind to the silver (amalgamation). The amalgam was then heated up in a kiln to drive off the mercury and leave silver and gold. Since the silver started out in a compound with a higher oxidation state (+1) and was now a metal with an oxidation state of 0, this process is also called reduction. There were several reduction mills in the Tintic District. The leftover ore, after heating, still contained appreciable amounts of iron and lead, and was dumped onto a heap in a molten state. 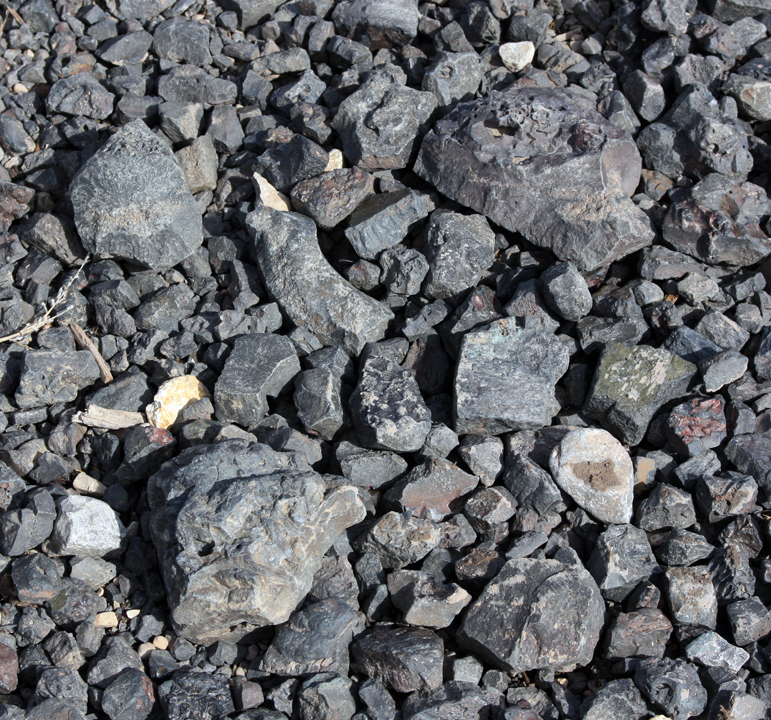 This waste material is called slag. Slag at the Knight Smelter. Sample under the tank foundations. Notice the layering of the soil; a layer of sand was laid down under the tanks when they were first built which is now covered with new topsoil. We moved on to the waste rock pile at Silver City where the Swansea Consolidated mine was located. Here, water runoff since the pile was created in the 1980s has washed small gullies fanning out south of the pile, crossing the road, and going on down the valley. The asphalt on the road is stained red with the iron sulfides. 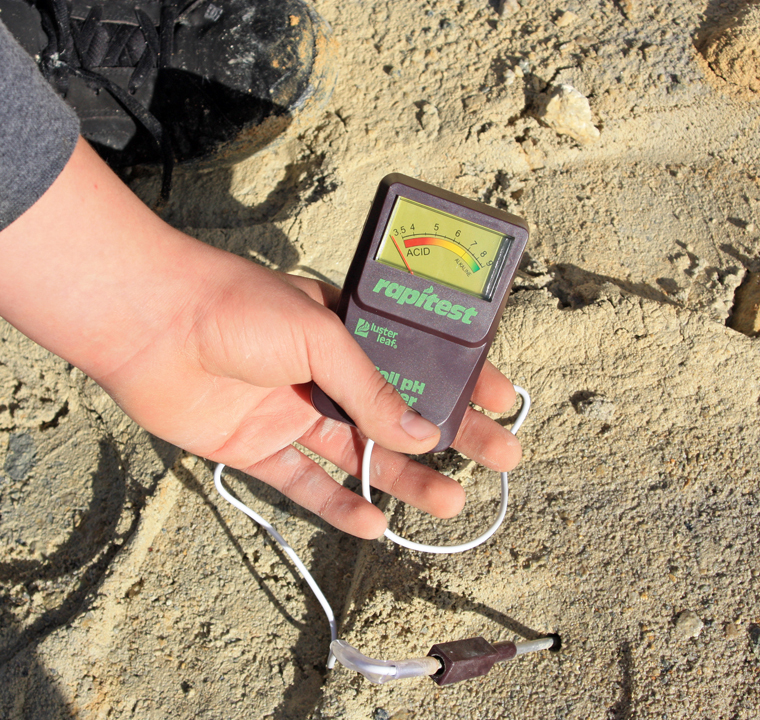 We collected on the pile itself, and used a portable pH meter to test the soil at locations on and near the pile. It was still too muddy to walk around much, and we were getting short on time, so we packed back up and drove back to Provo. We collected ten samples from five sites on this trip. 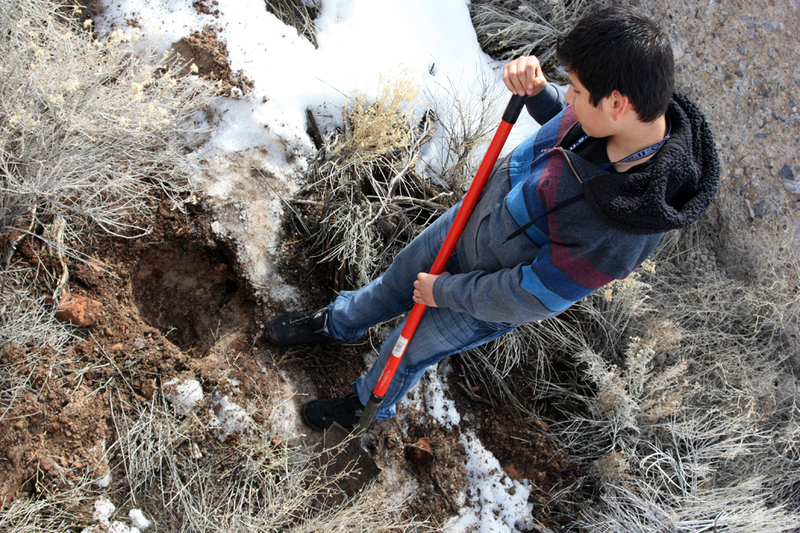 Testing the soil around the Swansea mine dump. The pH is very low, under 3.0.